Jian Yang with PhD student Chuying Ma displaying a bendable citrate-based material for bone repair. Image: Walt Mills/Penn State. "In our lab, we have been working with citrate for over a decade," said Jian Yang, professor of biomedical engineering at Penn State. "We knew that in the human body, 90% of organic citrate is located in skeletal tissue. But no one had really tried to use citrate as a building block to make bone biomaterials. Our new paper tries to understand how citrate helps in bone healing and uses the understanding to guide the design of new biomimetic biomaterials for better bone repair." Autografting – taking bone from another part of a patient's body and grafting it to a damaged area – is the main method used for bone regeneration in a hospital setting. This is not always a suitable method, however, especially in the case of large wounds or when bone tissue is removed during cancer treatment. Synthetic biomaterials would be a welcome replacement and many labs are working on developing them. But current synthetic materials can cause significant inflammation, and the bone healing rate is often slow and the healing quality can be poor. This is because the body tends to encapsulate the implant with fibrotic tissues that keep it from integrating with surrounding bone. With Yang's material, the researchers do not see encapsulation, and chronic inflammation is minimal. Chuying Ma, a doctoral student in Yang's lab, is lead author on the paper. Ma was given the problem of elucidating the poorly understood mechanism underlying the body's use of citrate to regenerate bone. 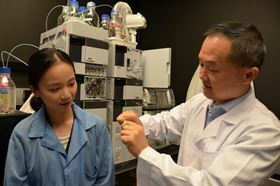 She found that the outer membrane of bone stem cells contains a transporter that is used to transport citrate into the cell to elevate the cellular energy level. "Using our new material, we see the early deposition of new bone at one month," Ma said. "This is much earlier than the biomaterials widely used in FDA-approved devices. In this study, we tested two models, the femoral condyle bone and cranial bone defects." In both animal models, they found that the new biomaterial was better than commercial materials at inducing early bone formation and also promoting bone maturation.